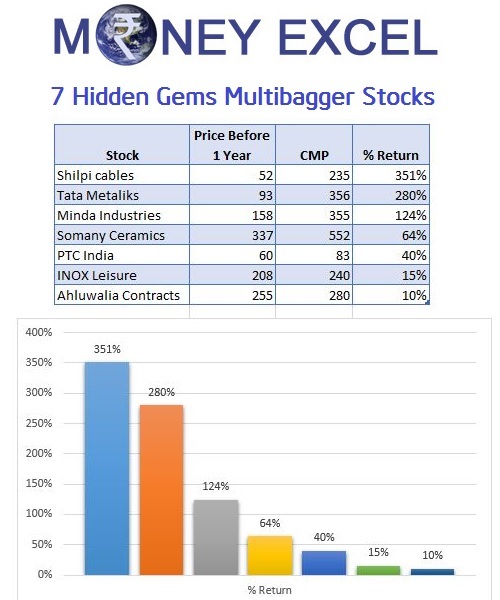 A hidden gems multibagger stocks are high quality less popular stocks that are creating wealth for the investor quietly. A hidden gem multibagger stock can make you wealthy in a short period of time. However, finding a multibagger stocks on Dalal Street is not child’s play. It demands a lot of skill, hard work, and research. In this post, we will discuss 7 Hidden Gems Multibagger stocks of 2017. Focus only on small cap and mid cap stocks with a market capitalization in the range of 900 Cr to 6800 Cr. Identification of high quality less popular stocks. Checking performance history and Future business potential of the company. Checking stock recommendation by analysts. Considering stocks from every sector to make a diversified stock portfolio. Listing down Hidden Gems Multibagger stocks for investment. Based on above method identified hidden multibagger stocks for investments are given below. Shilpi Cables is first hidden multibagger stock for investment. Shilpi Cable is leading and fastest growing company in cable segment. They supply cables to the automobile, telecom, and energy segment. New initiatives of government like make in India, digital India, and smart city will surely add a boost to the growth of shilpi cables. The company is also working on diversification by adding new products. They are also planning to enhance global footprint. In last one year, Shilpi Cables has given 351% return to the investor. Looking at future business prospects this stock is expected to perform better in future. Tata Metaliks is next hidden multibagger stock for investment. Tata Metaliks is small cap bluechip stock belongs to Tata Group. Tata Metaliks is leading manufacturer and supplier of Pig Iron and ductile pipes in India. A growth in urbanization and infrastructure development will lead to increase in demand of water and waste water pipes, which will be beneficial to Tata Metaliks. In last one year, Tata Metaliks has given 280% return to the investor. Tata Metaliks is expected to give a similar return in the future also. Somany Ceramics is another recommended hidden gems for investment. The industry in which this company operates is badly impacted due to demonetization. However, keeping in pace with upcoming projects of the government like housing for all and Swachh Bharat this stock is likely to get multifold benefits. A fall in natural gas pricing and raw material required for manufacturing of ceramic is additional plus point for this stock. This stock was able to generate 64% return in last one year. 7 stock market analyst has recommended a buy rating on this stock. Ahluwalia Contracts is Engineering, procurement and construction contractor. The order book of Ahluwalia contracts is very healthy. In addition to that company has very good execution capability. The company is largely focusing on high margin public orders. The company is largely focusing on reducing borrowing cost and debt level. Ahluwalia contract is recommended stock by 11 different stock market analysts. INOX Leisure is next potential multibagger stock. INOX Leisure is a second largest multiplex player in India. A multiplex culture in cities are growing significantly. A multiplex segment is passing through boom phase which is likely to continue in future. In addition to box office collection, INOX has huge potential in advertisement revenue. INOX Leisure is recommended the stock for investment by 12 different stock market analysts. Minda Industries is Automotive sector company dealing in switches, lighting, and horns. An automotive sector is passing through a bad phase due to demonetization. However, Minda Industries is showing unexceptional growth due to increase in customer base, upcoming joint venture and an addition of new products. In addition to that Minda Industries is also going towards group consolidation which will help them in reducing the margin. The company is also planning to expand global footprints. 10 stock market analyst has recommended investing in Minda Industries. PTC India is country’s largest power trading company. The company operates on very thin margin. However, steady and known cash flow are a positive side of this company. PTC India has started diversification by introducing financial service and energy business. PTC India has given 40% return last year and it is expected to perform in future with the same pace. 10 stock market analyst has recommended investing in PTC India. Reference – 5 out of 7 stocks mentioned above are taken from Economic Times study report. What is your call about this identified hidden gems multibaggers stocks? Do you carry these stocks in your portfolio? Do you think that these stocks will outperform in future also? Do share your valuable comments and suggestion in the comment section. shilpi cable looks really good for 349…. I want to invest Rs. 50000/- in one or two penny stocks (which is Rs. 1 to Rs. 5). please advise for long term around 5 to 10 years. Sir, I have been following your blog for a year now, being new to finance and share markets, I found your blog enlightening and informative. Thank you that. I would like to ask your views on the future multi bagger which we can invest in 2017. Future multibagger stocks are already mentioned in the article.